WWI Lost Messages Discovered - An Exhibition. Duraprints is exited to be involved in sponsoring an exhibition as part of the National Trust 2014 Heritage Festival. 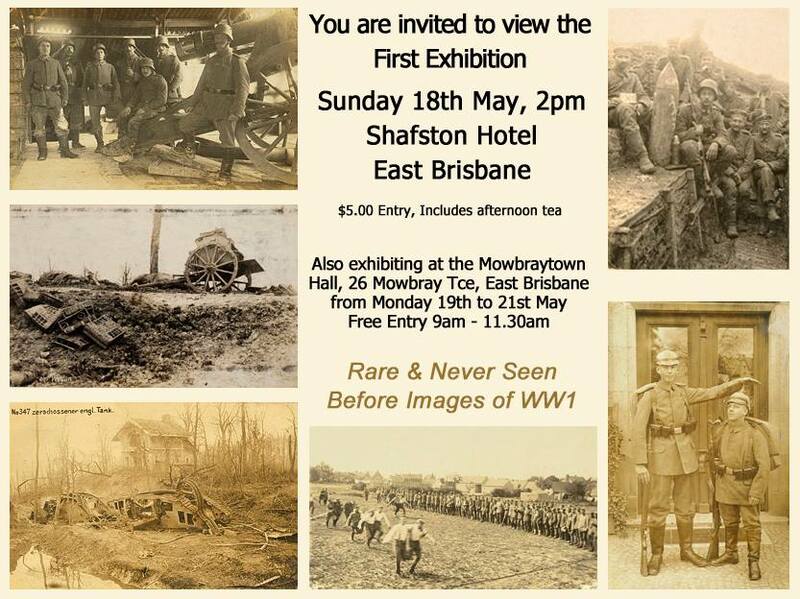 The exhibition of World War One Photos and Stories will be officially opened in the upstairs function room of the Shafston hotel, corner of Lytton rd and Wellington rd, East Brisbane at 2pm on Sunday the 18th of May 2014. $5 entry includes afternoon tea. The exhibition will continue at the Mowbraytown Hall, 26 Mowbray terrace East Brisbane with free entry, from the 19th to 21st May, 9am to 11.30 am each day. The exhibition includes local heroes photos and stories plus a collection of German World war 1 photo postcards showing diverse scenes of the war front in Europe and it's devastating consequences. 370 images in total, this collection includes personal messages on the back of the photos that have never been exhibited or published before. With the help of an elderly German gentleman many of the messages have been translated to English. Because there are no post stamps on many of the cards we believe they were never sent or received by loved ones. We are working to develop a website containing all the images and text in the hope that we can connect these lost communications from 100 years ago to relatives and descendants of the family and friends that they were originally intended for.